1) What is the role of a Business Analyst in any organization? Answer: A business analyst is a means of cooperation between different stakeholders in an organization. He/ She acts as an intermediate and helps to the complete project teamwork as a closely integrated unit. Since stakeholders belong to different dominions, such as a finance, business, marketing, etc., it’s very important for a business analyst to be able to sort and balance the needs of these stakeholders meanwhile fulfilling the business objectives at the same time. 2) How can one define ‘Requirement’? Answer: A requirement is a capability possessed by a solution to solve a certain problem or to achieve an objective. Requirements are defined as an input to various stages of SDLC and must be properly documented and validated by the business users/stakeholders. 3) What do you mean by a Requirement Elicitation Strategy? Answer: The Requirement Elicitation Strategy depends upon the type of problem faced by the organization and hence, the business analyst. A business analyst can take advantage of direct collaboration with the client and can organize facilitated workshops, interviews and observe the end users. In concurrence, one can use techniques that provide more precise information like prototype and scenario building. 4)What are the features of a Good Requirement? Specific: The requirement should be specific so that it can be properly documented. Measurable: One should be able to measure the success criteria of the requirement by different parameters. Attainable: The requirement should be possible to attain with the given resources. Relevant: The requirement should be in line with the project’s business case. Timely: The requirement should be posted in time, preferably early in the project lifecycle. 5) When is the need for ‘Requirements’ over? They are stimulated from all the stakeholders from all the key stakeholders of the project. They bring into line with the project’s business case. When the stakeholders of the project are in agreement with the elicited requirements. When all the requirements which pass the above four criteria are attained, they are considered to be as formal and final. These requirements are then documented and become a part of the project scope. 6) What are the documents that are typically required by a Business Analyst? 7) When coming up with a test case, what are the typically recommended practices? Initially, isolate both functional and non-functional requirements in a use case. Then include the use case diagrams along with the use case. Finally, include the UI details/notes in the use case. 8) What do you mean by a scope creep? Answer: Scope creep, preferably called the requirement creep is a term that denotes uncontrolled changes/deviation in the project’s scope without an increase in the other resources (schedule, budget) of the project. It is a form of risk to the project and is usually caused by poor project management, improper documentation of the project’s requirements and poor communication between the project’s stakeholders. 9) How to avoid scope creep? Clear documentation the scope of the project. Following the proper change management. 10) What are the skills that should be necessarily possessed by a business analyst? Answer: A business analyst must hold fundamental skills such as elicitation skills, problem-solving skills, communication, and management skills. He/ She must also have knowledge of IT skills, software development understanding and domain knowledge regarding the domain he/she is working in. 11) Differentiate between an exception flow and an alternate flow of a use case. Answer: The Exception flow is the path traversed in case of the error or an exception being thrown. For example, consider that you are on a Login page the ‘Forgot password’ is the alternate flow and system showing ‘404 error’ when correct username and password are entered is exception flow. The Alternate flow are the alternative actions that can be performed apart for the basic flow and might be considered as an optional flow. 12) What do you know about a case model? Answer: A use case model is a set of actions that can be performed by the end user to perform a task or a goal. Let us consider a user, specifically a user of Gmail may log in, write an email, send an email, and then log out. The second set of actions can be login to Gmail, delete several emails, and then log out. A business analyst tries to map out all the use cases (including exceptions) to make sure all the requirements are covered and well thought through. 13) What do you know about a traceability matrix? Answer: A change in one requirement can impact another requirement or test case. These compressed requirements or test cases need to be updated. A traceability matrix will tell you which requirements or tests need updating. 14) What are the main duties of any business analyst? Work closely with all the stakeholders in the project. Ensure a clear understanding of data requirement and prepare project plans. Check if any project requires any special check and provide project assistance. Act as support system during implementation. Prepare training material and support implementation material. Quality improvement of products and services delivered by technology. Coordinate between technology and business. 15) How can an ideal business analyst fulfill the expectation of the members of his team as well as the organization? Know the expectations of the members as well as possible. As an analyst, one should be aware of the deliverable and the boundary of the work to be done. Get proper information about the project through the statement of work. Engage and interact with all the internal teams regularly. Make sure that you are well aware of their concerns, their expectations, etc. They should be aware of what is expected of them and they also have the correct and updated information about the project. Know your clients’ business. This will help you to make good decisions and will also help you contribute to the client’s goals. Try and get all possible and useful information about the client form the sales team. Explain to all the vendors their role in the project from the very beginning. Do not hesitate to ask for information and make sure you plan your work accordingly. Understand the requirement of the project, the objective of the project, and the need of the project and the needs of the customers. 16) Does a Business Analyst require any IT/Technical Skills? If yes, what are they? Answer: Yes, a business analyst should possess a good amount of technical skills. Any business analyst is not required to be an expert in programming language but he/she needs to be comfortable with certain software tools. Some of the tools and software concepts a business analyst is required to be aware are along the given lines. Testing tools:Any business analyst acts at work as testers. So, they are expected to possess a good knowledge of testing tools that help in the release of the system/allocation. MS Office:Any business Analyst should be proficient with MS office tools such as MS Excel, MS PowerPoint, and MS Word. These tools help in the daily operation of work. Mind Map:To explore details about a particular situation. Prototyping tools:As a business analyst, one is required to evaluate and also look for feedback on a requirement. Prototyping tools help a lot. The favorite prototyping tool widely used is Pencil. Requirements management tools:There are quite a few requirement management tools available in the market. They help in managing requirements or the needs of the product. BPM Tools:Help in visual representation to communicate the process flow. Basic knowledge about OOP languages and Database structures. Modeling tools:To draw diagrams. The popular ones are YUML.ME, Architect enterprise, etc. 17) What is the FRD and the SRD? Answer: Both FRD and SRD are forms of documents that are related to a use case. The FRD is an acronym for Functional Requirement Document while the SDD is an acronym for System Design Document. 18) What are the personal skills that make a Business Analyst different from all others? Strong analytical skills to perform their job well. Problem-Solving skills:They need to have the ability to create a workable solution, find ways to resolve the problem and move forward towards successful completion of the project. Excellent Communication skills:To communicate with clients, developers, testers, etc. about project requirement, changes required. Technical Skills:Business analyst needs to have knowledge about a few testing, designing, reporting software. They need to know what technology tools are being used and what do they have to offer. Customer focused:Should be able to understand and get client’s requirements fulfilled. Decision- Making Skills:As an analyst, you should be able to assess the situation and select the best course of action. You need to be able to understand the viability of the solution. Managerial Skills:A business analyst needs to plan the project scope, he/she needs to direct the team members, forecast budget, handle change request, etc. He/she needs to have the ability to manage the project. 19) Do you know anything about a database transaction? Answer: Any activity performed on a database is called as database transaction. The various activities that can be carried out in a database are addition, deletion, modification, searching etc. 20) Do you know anything about the OLTP systems? Answer: OLTP is the acronym for On-Line Transaction Processing. These systems can carry out the transactions from any kind of database at a remarkable speed. They are used for data entry and data retrieval from database. 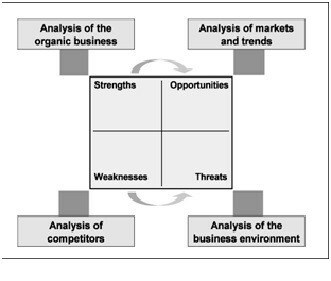 21) What is the SWOT Analysis? SWOT is an acronym for Strength, Weaknesses, Opportunities, and Threats. It is a technique popularly used for analyzing and assessing the organization for these things. It helps in any decision making process when there is a change or improvement required in the organization. 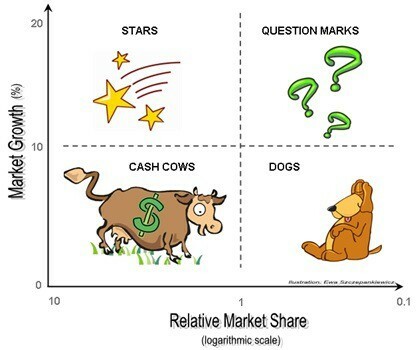 22) Elaborate on the BCG Matrix. 23) Elaborate on the PUGH Matrix. The PUGH matrix is also referred to as the Problem/ Design matrix. It helps in deciding the most optimal and alternate solution and is now a major part of Six Sigma technique. 24)What do you know about the PARETO Analysis? Answer: The famous Pareto Analysis, also known as the 80/20 rule is actually a very popular decision-making technique. It aims at controlling the quality and resolving the defects. According to this rule, 80 % defects arise in the system due to 20 % causes. 25) How is a Business Analyst supposed to handle tough stakeholders in a project? Answer: Working with a difficult stakeholder is definitely not easy- be it a common employee or a business analyst, but it is not impossible. As an analyst it is very important for the concerned to understand the individual, his /her viewpoints so that the business analyst is able to build an effective relationship with the person. The business analyst should try to talk with facts and figures and in a way that is most convenient to the stakeholder. The business analyst ensures that his/her work is completed with utmost ethics to build trust among the stakeholder which helps him/her to build a good work rapport with the stakeholder. Trust and logic is usually the key while handling the tough stakeholders. 26) What are the different types of diagrams that a Business Analyst is usually accustomed to? Use Case diagrams:This is the most used diagram and is also known as the behavioral diagram. It is used to describe a group of actions that the system performs with one or more user. Collaboration diagram:It resembles a flow chart and is also known as the communication diagram. This diagram is used to show how the object communicates to achieve the result. It is an interaction diagram that shows the relationship and interaction between software objects. Activity diagrams:This diagram shows the work done by the different department of the organization. It shows the systems activities. It shows the flow of one activity to another from one department to another. Data Flow diagrams:It is a graphical representation of data and shows how the data is shared in the organization. It shows how data comes in and goes out of the system. Class diagram:The class diagram is a type of static structure diagram that shows the structure of a system by showing the system’s classes, technique of operations, attributes and the relationships among objects. Sequence diagram:This is one of the popular diagrams and this diagram shows the sequence in which any message is passed from one object to another. Entity relationship diagram:This is a data modeling technique which shows the relationship between the entities. 27) What do you know about FMEA? FMEA is an acronym for Failure Mode and Effects Analysis. 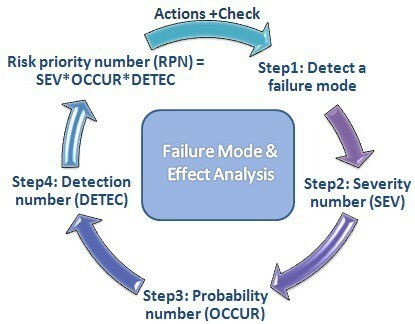 It is used in product development, system engineering, and operations management to identify various failure modes and how severe can their effect be on the system. 28) Differentiate between the BPMN and the Gateway of BPMN. Answer: BPMN is the acronym for Business Process Model and Notation. It provides a graphical representation of the various processes that need to be carried out in a business. The BPMN Gateway is a processing modeling component. It is used to control the sequence of processes to be followed and flow of interaction. 29) Who are the actors in a use-case? Answer: In the use-case, there are four types of actors- Human, hardware, System and Timer. Usually there can be two types of actors in a Use case- the Primary Actor and the Secondary Actor. While Primary actors initiate the process, the Secondary actors are given the function of assisting them. 30) What do you know about Bench marking? Answer: Bench marking is an activity aimed at studying the different industry practices with the objective of achieving competitive advantage in the market by assessing the competitors of the particular field. 31) What are the different steps that a business analyst must follow while bench marking? Identify the problem to benchmark in order define the scope of the work to be done. Decide and prioritize the processes that need to be bench marked. Identify the different companies that have a similar product and specifically note down the leaders of the industries as well as the concerned companies. Do proper research on which process or practice can be favorable and if they are feasible enough to be adopted by your organization. After researching, identify the practice that can be implemented in your company. Finally, make a proper plan for improvements. 32) Explain the 100-point method. Answer: The 100 -point method is used to set up the priority for different steps in a process. In this method, all the group members are required to assign points to every step in the process individually. The points earned by each step are then calculated and the step with highest points is awarded the highest priority. 33) What is the Kano Model? Answer: The Kano model was developed by a professor, Dr. Noriaka Kano, in Japan. This model encourages one, i.e., the business analyst specifically to see how the product relates to the customers’ needs. 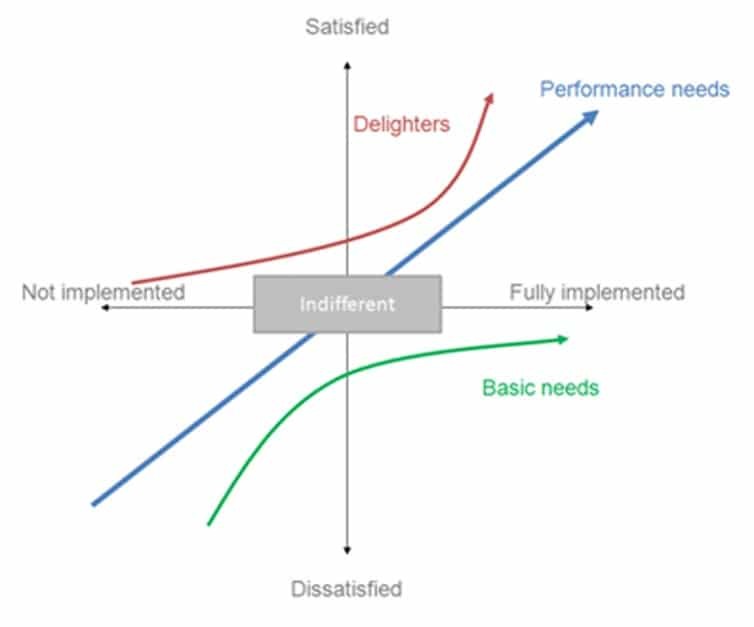 34) How can a user use the Kano Model effectively? Threshold attributes:These represent the basic features expected by the customer. Performance attributes:These attributes are not necessary but they increase the customer’s enjoyment of the product or service. Excitement attributes:These are the surprise elements that occur in any project. The customers are not aware of them but when they see them, they are bound to be delighted. 35) What is the best way to use the Kano Model to impress the customers? Research all the attributes of the product and what he/she can do to please the customers. Classify the attributes found under the three categories previously mentioned. Add more types of attributes but do not add value to these because remember, the customers do not care about these attributes. Ensure that the customer’s product has all the threshold attributes. Assess the excitements attributes and identify the means to add these attributes to the concerned product. While maintaining a profit margin, choose a performance attribute that you can afford to deliver along with your product or service. Understanding your customer’s expectations and generating ideas to improve your product helps to carry out Kano Model analysis successfully. 36) Explain the Business Analysis Process Flow that a good Business Analyst usually follows. Collect background information:The information contains fact such as what domain the project is in, is it a new project or ongoing, what could affect the project. Getting all this information helps the business analyst to understand the project well. Know all your stakeholders:It is important for the business analyst to identify all the stakeholders. They are the ones who make decisions on requirement and priorities. Find your business objective:This will help the business analyst to stay focused on the vision. To establish you objective you can use different techniques such as brainstorming, SWOT analysis, focus group, etc. Evaluation of options:This is an important step and the business analyst needs to narrow down his/her options on the basis of cost, feasibility, an acceptable return on investment, funds available, etc. Scope Document:This is a document which has the list of project development goals. Delivery Plan:Prepared specifically by the business analyst, this document will give a detailed timeline for delivering the requirements to the development team. Define business requirements:Clarify the requirements with the business owner/ authorized person and get an approval to deliver them to the development team. Support implementation:Check if the deliverable align with the requirement, manage changes from the business owner, update or repackage requirement. Evaluate value added by the project:To maintain the business objective through the implementation, the business outcomes need to be evaluated. Evaluate the actual process, the timeline and see if you are on track. Based on the feedback if any, provide modifications. This entire process is important as it helps the business analyst to set the tone for the entire development project and this will make the entire process smoother. 37) What do you know about SQUARE? Answer: SQUARE is an acronym for Security Quality Requirements Engineering. It is a software engineering step that deals with documenting the security requirements of the system. 39) What is a user-centered design methodology? Answer: In the user-centered design methodology, everything is done to make the end users comfortable and happy with the final product. The system is developed keeping in mind the end users and their requirements etc. The effectiveness of a system is judged by its “Application Usability”. 40) Explain the concept of ‘Personas’. Answer: Personas are fictional characters that show the specific segment of users within a targeted demographic. The business analyst uses personas with market segmentation. Personas help designers to understand the different attitudes and behaviors of users within different demographic sections. 41) What are the various things that need to be considered to build a foundation for a persona? Goals: The business analyst should be well aware of what the persona is trying to achieve. Desires: One should also know what motivates the persona to act in a specific way. Skills: The designer should know about what abilities the persona does have. Attributes: They help in differentiating characteristics a persona represents. Persona image: This gives the designers an anchoring point for the persona in their mind. Character: These describe the different details about the persona. Location: This describes the surrounding that the persona functions within. 42) What is the top skill that a Business Analyst must possess? Answer: Any good business analyst always has to have excellent communication skills- oral and written. A business analyst is required to interact with many facets of people and hence, they need the ability to talk with each person at their level. Sometimes the business analyst id required to take the initiative and be independently reliable. This usually happens if the role of the business analyst will be less task based and more concerned with identifying issues and putting solutions in place to solve them. 43) What should a good business analyst do when he/she encounters conflicting stakeholders? Answer: When such a situation occurs, the business analyst must make an attempt to sit down with the conflicting parties and negotiate according to their terms. The analyst must dig deep into both requirements in order to understand the roots. He/she them need to try to find a way to come to a resolution that works for everyone or at least reach an agreement on which requirement has more value to the business overall. 44) What is a Flowchart and why is it important to a business analyst? Answer: A Flowchart shows the complete flow of system through symbols and diagrams. It is important because it makes the system easy to understand for developers and as well nontechnical stakeholders. 45) What is the Use Case Model? Answer: The use case model shows a sequence of events and stream of actions regarding any process performed by an actor. 46) What do you know about the Activity Diagram? Answer: An activity diagram is all about system activities. The main purpose of an activity diagram is to show various events taking place in an organization in different departments. 47) What are the different types of diagrams commonly used in a Business Analyst? Answer: The two diagrams that are commonly used by a Business Analyst are Use Case Diagram and Collaboration Diagram. 48) What do you mean by an alternate flow in a use case? Answer: The alternate flow of use case is the alternative solution or activity in a use case that should be followed in case of any failure in the system. 49) What do you know about Exceptions? Answer: Exception are the unexpected situations or results in an application. 50) What do you know about Extends? Answer: Extends are relationships that are shown by dotted line. It is usually used to specify optional behavior which has no independent meaning. For example, the Help on “Sign on” extends use case “Sign on”. 51) What are the documents related to a use case? Answer: The two documents that are related to a use case are FRD which stand for the Functional Requirement Document and the SDD which stand for System Design Document. 52) Differentiate between Business Analyst and Business Analysis. Answer: Business Analysis is the process performed by the Business Analyst. Answer: INVEST is an acronym for Independent, Negotiable, Valuable, Estimable, Sized Appropriately, Testable. It can assist project managers and technical team to deliver quality products/services. 54) Do you know anything about SaaS? Answer: SaaS is the acronym for Software as a Service. It is related to cloud computing. It is different from other software bundles as one doesn’t need this type of software to be installed on the machine. All that is needed is an Internet connection and a Web Browser to use it. 55) How is a product developed from an idea? Answer: In order to develop a product from an idea, one needs to follow the given steps. The business analyst needs to perform, Market Analysis, Competitor Analysis, SWOT Analysis, Personas, Strategic Vision and Feature Set, Prioritize Features, Use Cases, SDLC, Storyboards, Test Cases, and Monitoring, Scalability. 56) Between the Waterfall and Spiral Model, which is better? Answer: The advantage of any method depends on the type and scope of the project. A life cycle model is selected on the basis of organizational culture and various other scenarios to develop the system. Hence, both the models are useful and good in their own respect. 57) What is Application Usability? Answer: Application usability is the quality of the system that makes the system useful for its end users. System’s usability is good if it is capable of achieving users’ goals. 58) What is a misuse case? Answer: The misuse case is a term derived from use-case. Unlike use case, a misuse case is something that shows – what kind of nasty activities can be performed by an actor that may result in system failure. 59) What do you know about the Agile Manifesto? Answer: The Agile Manifesto is a guide for software developers about the Agile development principles to ensure iterative solutions. 60) What are the five basic elements’ categories in BPMN? Answer: The five basic elements’ categories are Flow Objects, Data, Connecting Objects, Swimlanes, and Artifacts. 61) What is the Pair-Choice Technique? Answer: The Pair-Choice Technique is used to give priority to various items in a process. It is mainly used when distinctive stakeholders are involved in the project. 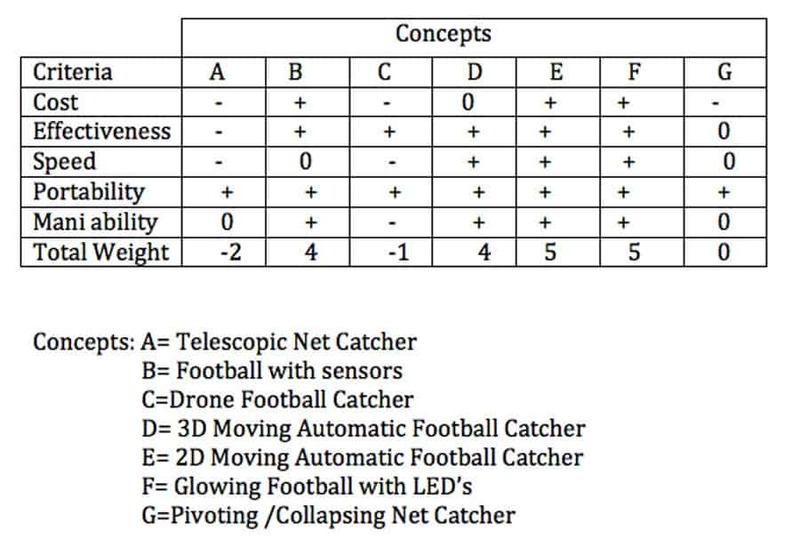 This technique asks the group to compare each item with the other and select the one having the highest priority. 62) How to make an effective use-case model? Answer: It is recommended to make two separate diagrams for an effective use-case model. One serves as a use-case, and the other serves as an actor diagram. This is done so that we can highlight all the possible activities in a use case & in actor diagram and then we can merge both the diagrams to get an effective use-case diagram. 63) What is the difference between a Swimlane and a Pool? Answer: A Swimlane is related to a group of activities on an activity diagram while a pool is dedicated to only the activity of a single person. 64) What do you know about a Fish Model and a V Model? Answer: The Fish model is comparatively very costly and time-consuming, while, V model requires less time and cost. Moreover, the Fish model is used when there were no ambiguities in the customers’ requirements. In all other cases, the V model is preferred. 65) What are use case points? Answer: The Use Case points are used to evaluate the cost of work done to develop the system. 66) What do you know about PEST? Answer: PEST is an acronym for Political, Economic, Social, and Technological. It is used to analyze business environment, in which it has to be operated. 67) What are the four important phases of business development? Answer Agile is a technique that uses several light-weight methodologies such as Rapid Application Development (RAD), Extreme Programming (XP) and SCRUM. All these methodologies focus on the development of iterative solutions. 69) What do you know about the Scrum Method? Answer: The Scrum Method is one of the agile methods that is used to develop iterative information systems. In this method, a small team works on the assigned tasks for a time period of 30 days usually. 70) Elaborate the terms JAD and SWEBOK. Answer: JAD is the acronym for Joint Application Development while SWEBOK stands for Software Engineering Body of Knowledge. 71) Elaborate on the various processes that need to be followed while developing a product from an idea. Market Analysis– This is a business plan through which the characteristics of a market have been studied, like how the market changes and behaves dynamically. SWOT Analysis– This is a process through which the Strengths, Weaknesses, Opportunities, and Threats of an organization are identified. Personas– These are typical users of websites or intranet who represents the goals and characteristics of various large groups of users. Personas replicate the real users in functional design. Competitor Analysis– Evaluation of the strengths and weaknesses of outside competitors. Strategic Vision and Feature set– The process of developing the goals in present and planning to achieve the same in future by moving towards the vision. Prioritize Features– All the features of the product that is to be developed are prioritized by the product management to help the development team. Apart from the above-mentioned steps, there are furthermore terms involved in the process of developing a product. such as Use case, SDLC, Storyboard, Test Cass, Monitoring, and Scalability etc. Business Analysis is one skill that has been there for decades and will stay here forever. Irrespective of technology and industry, business analysts are always on demand. Business analysis is the must have skill to develop any kind of system. 71 Top Business Analyst interview questions listed above will help the job seekers who opted the career path of system analyst or business analyst irrespective of experience.